Adam will be appearing on Political Pistachio tonight at 10:00 p.m EST. Eric Dondero has been a supporter for a long time now and was interviewing Adam about Sarah Palin long before it was the in thing to do. Thanks again for everyone's support. Just so that you all know, I did receive a brief phone call tonight from Todd and Sarah Palin. Thanks to them for being so kind. Steve Maloney (our longest standing supporter), Kristopher Lorelli of PalinForVP.com (who put in TONS of leg work), PalinforAmerica.com, Students of America on MySpace, the original "Ted" (easily our most vocal advocate), Eric Dondero, Trish Houser of Palintology.com, all of the media who were willing to interview me before interviewing me was cool, and everyone in the comments section who kept the faith. I'm sure I'll think of more, but that's a start. UPDATE: Larry Elder Show, KABC Los Angeles. 7:20 OM Eastern/4:20 Pacific. FoxNews: 5 PM Eastern/2 PM Pacific. Not sure exactly where in that program I am, but I will be on during that hour. Fox & Friends: 8:00 AM Eastern tomorrow morning on FoxNews. UPDATE: Read the official McCain campaign press release. Every network is reporting that Gov. Palin will be introduced as McCain's pick shortly. I'l have a lot more later, but needless to say I am positively elated. I won't post all of the details, as you can get those by tuning to any news channel, but Gov. Palin has ALL of the late buzz this morning. I haven't been able to read all of the hundred of comments left here since I went to bed at midnight, so mega kudos to whoever found that flight from Anchorage to Dayton. We're almost there. Put the champagne on ice and get ready for a party, we'll know for sure who gets the nod in a few hours (maybe sooner). I'm going to try to get permission to blog from the office today. No guarantees, but I have a hunch I might get it. Okay, I've had enough of sitting on pins and needles. So, I figure we should do what every other campaign does on "election night": Pat ourselves on the back, blast some loud music, and call it a "victory party". This song seemed extremely appropriate. Have a great night everyone. I'll get back on when I hear any news, but right now I have to catch the subway home. Well, it appears that John McCain will have a VP candidate in place within 24 hours, and I personally think that Gov. Palin has a shot. If you believe the Drudge Report, the pick could leak as early as 6 PM (Eastern) tonight, with possible confirmation by 8:00 PM. Granted, I'm taking all reports from "sources" with a large grain of salt; but if this is true, I think the pick could be a surprise. If there is indeed a plan to make the pick known BEFORE Obama's acceptance speech tonight, then it had better be a bang up announcement that will throw Obama off his game and steal a lot of news. Otherwise, the smart way to unveil a "safe" (meaning "boring") pick would be to wait until tomorrow morning so as not to compete with a bigger event. Either way, this has been a fantastic ride, and you all have done a tremendous job promoting the Gov. Palin. Regardless of what happens, we can hold our heads high, as just getting Gov. Palin on the list was an accomplishment. Furthermore, no matter who is selected tomorrow, our movement will continue with a "Phase 2" project to continue to promote our favorite governor (to be unveiled at a later date). So, pat yourselves on the back and chill the champagne. Hopefully, the entire world will know Sarah's name by this time tomorrow. Hello Everyone. I apologize for being offline longer than I expected, but I have had trouble setting my connections up, and as I live in a building owned by a 501c3 non-profit organization, I’m prohibited from blogging at home. Hence, I send you my greetings from the McDonalds WiFi in Washington, DC’s Union Station. As we enter the final week, Gov. Palin’s name is increasingly mentioned in the media, and Monday and Tuesday were our first ever consecutive days with over 5,000 hits each. Keep the faith. We’re almost there, and I have a bottle of Sparklig Cider chilling in the fridge for Friday (my building doesn’t allow alcohol, or else it would have been champagne). In the meantime, I have written a little pep talk to make sure that we keep our spirits high. Sarah Palin is an anomaly in American politics. It’s not because she’s a woman, not because of her blue-collar background, and not because of her ability to juggle the titles of “governor” and “committed mother of five”. Forget about all of that stuff for a moment; it’s interesting, but if Barack Obama has taught us anything, it’s that a compelling biography is not a qualification for leadership. Instead, Palin is unique because she can claim one of the broadest bases of support of any leader in our country. Other than the lunatic fringes of Alaska’s kleptocratic political establishment, nobody hates her. Most politicians rise to power because they represent a certain wing of their party, and even some of their own partisans detest them. Mike Huckabee will never resonate with libertarian republicans, social conservatives cannot support Rudy Giuliani, certain evangelicals will always have a problem with Mitt Romney, and frankly I doubt that hard-core conservatives will ever fully embrace John McCain. That doesn’t make them bad candidates; it just means that they face significant opposition within the Republican Party. Sarah Palin does not have that problem. I have been working to draft Gov. Palin as Vice President since February of 2007, and I can recount first hand how she has united divergent views among Republicans and is now even gaining Democratic support. The key is that she offers a combination of qualities that make her a hero to many, many different groups. For instance, two of our strongest bases of support have been social conservatives and libertarian republicans, who are normally at each other’s throats. However, she offered both groups something that they desperately wanted without compromising any appeal to the other. The SoCons loved her pro-life, pro-family, and pro-gun positions, while the libertarians and fiscal conservatives cheered her on as she vetoed hundreds of millions of dollars of wasteful government spending. Getting those two groups to sing kum-ba-ya was enough of an accomplishment, but now it appears that a third group has found what it wants in Gov. Palin: McCainocrats. For those Democrats who are considering abandoning the Obama ticket (primarily disillusioned Clinton supporters), Palin represents the final push into the Republican camp. Not only is she a woman (which, like it or not, is an issue for some voters), but she also puts a fresh, future-oriented face on the McCain campaign. By upending Alaska’s corrupt political class, Palin has actually produced the type of change that Barack Obama can only talk about; and her collar is far bluer than Joe Biden’s ever was. Furthermore, she is arguably the only candidate who has the necessary expertise to address the single most pressing issue in this election: gas prices. As Governor of Alaska, Chair of the Interstate Oil and Gas Compact Commission (America’s largest interstate organization), and a former Chair of the Alaska Oil and Gas Conservation Commission, Sarah Palin can run rings around almost anyone when it comes to oil. The last candidate to assemble such a broad coalition of support was a gentleman by the name of Ronald Wilson Reagan. He not only won the presidency in two successive landslides, but went on to become one of the most beloved and effective presidents in recent history. Now, I realize that it is somewhat presumptuous of me to make this comparison, but I personally have no doubt that Sarah Palin has the capability to become the next Reagan. In fact, the only real question that I have heard is whether we should bring her to the forefront now as a VP candidate or save her for later as a full-fledged presidential hopeful in 2012. I personally choose the former, because the latter involves the defeat of John McCain and the election of President Obama and Vice President Biden. 2008 will be a crucial election year, with the winner being handed the responsibility for the Iraq war, the gasoline crisis, the Russo-Georgian conflict, and any number of other issues. The stakes are simply too high to throw McCain under the bus and bide our time. Likewise, Sen. McCain should realize that the stakes are too high for him to select a VP candidate who simply “does no harm” rather than pushing his ticket over the top. There is one sure fire solution to this problem, one way to guarantee a McCain surge, one way to put Obama on the defensive, and one way to steamroll to victory in November. Her name is Sarah Palin. I'm just filling in for Adam in an admin support roll until he gets settled in DC and back online (hopefully tomorrow). But, he wanted me to let everyone know there's a new VP poll posted on Townhall.com (right under today's funnies). Romney is in the lead, but Kay Baily Hutchison is in second palce with 21%! Ouch! Gov. Palin is right behind her (17%). Run on over and let them know who we REALLY want on the ticket. Biden is a fast-talker who pulls no punches. He has an encyclopedic knowledge of foreign policy, and will try to bludgeon any debate opponent with all of the minutia of different situations. He is also a hothead who is overly fond of personal attacks. The best way to beat him is to make him look like a mean-spirited jerk (which is not hard), but unfortunately the punditry seems to think that McCain should now be forced to pick an aggressive VP who can crawl into Biden's gutter and beat him at his own game. I think that that's a horrible idea, and I'm not just saying that because I'm promoting Palin. 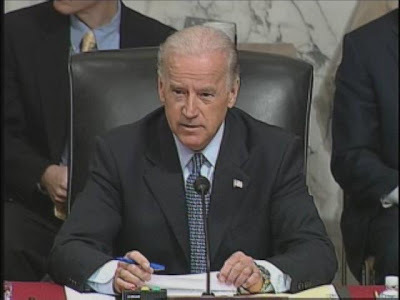 Biden is without doubt the best attack dog in the country, period. We aren't going to find someone who can beat him on that front. Furthermore, sinking to Biden's level would make the ticket look sleazy. Instead, we should note that Biden totally undermines Obama's "change" mantra, which McCain can now seize for himself by taking a reform minded VP from outside Washington. We can also show up Biden in the debates by selecting a calm, collected candidate who will show Biden for the hothead he is. Sarah Palin fits both bills. For one, Palin has actually produced the sort of change that Obama and Biden can only talk about. Secondly, she will refuse to play in Biden's mudpit, which makes him look even worse. Third, she knows how to debate hotheaded opponents. Biden compares very well to John Binkley, another fast-talking attack dog who ran against Palin in the 2006 primary. Palin filleted Binkley (and incumbent Gov. Frank Murkowski) by sitting back while they ranted and then delivering crushing one liners that made them look like bratty kids ("Alaskans deserve better than this."). Finally, Biden will do everything he can to attack his opponent on personal terms, which is very dangerous when you are running against a woman or a military parent. Biden WILL say something stupid in the debates, probably belittling Sarah for having been a housewife or mentioning that Track Palin is in the Army, and Gov. Palin will be ready with with a "you're no Jack Kennedy"-style response. Biden must not be allowed to interrupt the McCain game plan, which likely calls for a young, reformist VP. And when it comes to the debates, the secret will be to allow a cooler head to prevail over the fire-breathing Joe Biden. Gov. Palin is that cool head, and a reformer to boot. If she plays the debate right, she could reduce Biden from "distinguished senator" to "schoolyard bully" and nullify any gravitas that he brings to the Obama ticket. Due an influx of what we in the blogosphere call "trolls", I have changed the settings in the comments section. You must now have a Google account or an account with another OpenID-affiliated provider to comment. Apologies to all of my users who have been harassed, belittled, insulted, and verbally abused. We have, and will always have, a zero tolerance policy for trolls, haters, and liars; and I will be taking several other actions to ensure that this blog remains clean and free of abusive comments. Specifically, I want to point everyone to the new forum over at Palin for America. I did sign off on it's creation, but that does not affect the comments section here. I would encourage you use the comments section to address the topics discussed in my posts. Off topic discussions, however, can be moved to the more organized (and troll-free) PFA forum. This an addition to our movement, not a change. Secondly, be sure to watch tommorrow to find out who Gov. Palin will be shredding in the VP debate. For the record, I've been thinking Chet Edwards was "the guy" for several weeks. We'll have to wait and see. See you Sunday, and kudos to Kristofer and Steve for their great guest-blogging. For those who are worried about Sarah Palin's popularity in Alaska, think again! Two new ad's on the airwaves in Alaska for the Republican congressional primary feature Governor Palin, and she is not even running for Congress. Touting her endorsement is a clear sign she remains the most popular Governor in America. According to several media outlets, John McCain has NOT selected his VP nominee. I would caution everyone when listening to the speculation, as I doubt any of it is based on fact. Despite nearly six years of torture and solitary confinement, Senator McCain was unwilling to cave to his captors (Hanoi Hilton) in North Vietnam, so I am confident that members of the media have not been able to solicit any meaningful VP information from his campaign team or the candidate himself. I also find great humor in the fact that many of the media reports on Senator McCain's VP nominee are from news organizations that are "unfriendly" to the McCain campaign. The New York Times and Mark Halperin are not the John McCain Christmas card distribution list. The RCN has leaked a first draft of the list of speakers at the upcoming RNC convention (see here). This list is probably going to change drastically, for two reasons. #1 - Not one single member of Congress is scheduled to speak, and the speaking schedule has not been time stamped. #2 - It is fair to assume that one of the scheduled speakers is going to be nominated for Vice President. If John McCain had left off Palin, Romney, Jindal, Pawlenty or any of the other rumored names from the speakers list, then they would have had essentially tipped their hand to the media on who is on the shortlist for VP. The fact that Governor Palin has received a speaking role in prime time is a signal that she is held is very high regard by John McCain. Upon further examination of the this schedule, it appears as if just about all of the speakers are either close friends of Senator McCain or have been active in his campaign. As of today, there is no reason to be doubtful or discouraged. We are in this! Update; Mark Halperin (ABC News) has removed his post that suggested Romney will be the VP. Don't believe the hype. - Flavor Flave 1989. Dear Friends, this will be my last day doing guest posts on Adam's blog, one devoted to a thoroughly remarkable woman, Sarah Heath Palin, Governor of Alaska. All highly successful blogs -- and this is surely one of them -- are devoted in part to "breaking news." Frankly, at this point in the process, however, most of the "news" actually consists of "breaking rumors." Let me reminisce some about why I came on board when Adam asked me -- about 18 months ago -- to support someone whose name was barely familiar to me: Gov. Palin. Like so many of you, I had to learn how to pronounce Sarah's name correctly: PALE -in. One reason "Sarah for VP" had appeal to me so long ago was that I believed the conventional wisdom then about the person the Democrats would nominate for President. Of course (silly us), it would be Hillary Rodham Clinton, right? Nope! The Democrats have made a truly bizarre choice, an inexperienced, unqualified, untrustworthy, and dangerous (as in "invade Pakistan") man named Barack Hussein Obama. Would a McCain-Palin ticket beat an Obama-anybody ticket? They would beat them, as an old Pittsburgh-area sportscaster put it, "like a rented mule." The most recent Zogby poll had McCain leading nationally by five points (while Gallup and Rasmussen have the right roughly even). I believe Zogby is correct. As The Economist put it recently, the nation is suffering from "Obama fatigue." We've found that our golden-tongued orator is just a young windbag, a guy who does a great job reading a speech (that someone else wrote) off a TelePrompter. Since April (around the time of the PA Primary), I've been working with Supporters of Hillary Clinton, people who are very angry at the fraud and strong-arm tactics that took place in the Democratic caucuses. The NoBama Movement is large, and it is growing. On two of my blogs, I'm printing letter-after-letter from former Democrats, men and women who are leaving the Party they once thought was theirs. The MSM being the MSM, you probably haven't heard about that important development. In all probability, John McCain is going to be the next President. For him to choose Sarah as his running mate would be both bold and wise. Of course, we Republicans aren't exactly noted for boldness. Like Claude Rains in "Casablanca," our tendency is to "round up the usual suspects." At this time in history, the usual suspects -- say, a Mitt Romney or a Mike Huckabee or a Tom Ridge -- are not good enough. Such people are the "Ghosts of the GOP Past." They do not represent the future of the Republican Party or or of the country. Sarah Palin does represent that future. To be fair, there are other potential candidates, such as Bobby Jindal, Mark Sanford, and Eric Cantor, who will be part of that future. But McCain can't do better than Sarah, an individual synonymous with toughness, courage, integrity, and consistency. Sarah Palin is the quintessential Amrican. Let me end by saluting those of you who have embraced this remarkable young woman. You're doing a service to your country -- as she's doing for hers. (Note: I hope some of you who've visited my blogs -- and many have -- will continue doing so. Two of them are: the national one (featuring Bill Clinton's complicity in 9/11) and the Hillary Supporters one (featuring Democrats leaving their Party). My best to all of you. "With seven of the most-named running mates listed to speak at the Republican National Convention, the veepstakes over John McCain’s vice presidential running mate is anyone’s guess. "The convention line-up, which will be held in St. Paul, Minn., from Sept. 1-4, features Connecticut Independent Democratic Sen. Joe Lieberman on the first night; former Pennsylvania Gov. Tom Ridge and Alaska Gov. Sarah Palin on the scond night; former Massachusetts Gov. Mitt Romney and Louisiana Gov. Bobby Jindal on the third night; and Minnesota Gov. Tim Pawlenty and Florida Gov. Charlie Crist on the last night. "The third night is the night the vice presidential nominee will give his acceptance speech. Other speakers that night include Cindy McCain, former eBay CEO Meg Whitman and former Hewlett-Packard CEO Carly Fiorina. "Jindal has said he is not interested in the job but Romney has clearly indicated he would accept the nod. FOX News learned this week that Ridge is no longer under consideration because of his support for abortion rights. "McCain is expected to announce his choice for running mate at a rally in Dayton, Ohio, on Aug. 29. The date is his 72nd birthday and the day after the Democratic National Convention ends." Note that Mark Sanford, SC Governor, is NOT on the list. Tomorrow (Wednesday) I'll be writing a guest post about the close political and personal links Sarah Palin has to many critical interest groups, including: mothers (she has five childen), active duty soldiers and military families (her 18-year-old son is an infantry soldier probably headed soon to Iraq), women professionals (she is one), working-class families (her husband, Todd, has been a commercial fisherman and oil-field production worker), eductors (both her parents have been public school teachers), parents of special-needs children (her youngest son, Trig, has Down Syndrome), hunters and Second-Amendment supporters (she's a life member of the NRA), and several other voting groups. Drew Zahn of WorldNetDaily . . . is digging hard to establish the veracity of the various rumors that Sarah Palin will be McCain's choice for VP. He points out that a somewhat mysterious web site called McCainPalin.com "appears more legitimate than most" such sites devoted to various V-P choices. Zahn, whom I spoke to yesterday, says the following: "Palin has drawn attention as a potential running mate because of her youth and charisma, personally demonstrated pro-life beliefs and willingness to tackle tough issues, including an incident where she took on Republican leadership in her state for ethics violations.Editor Fred Barnes of The Weekly Standard last year called Palin 'a politician of eye-popping integrity.'" I'll have more tomorrow. Thanks for visiting Adam's blog. Take a look at the following link -- Palin on the shortlist. As for "believing" in general, I firmly believe Sarah will be the individual John McCain chooses as his running mate. She would bring an energy -- a dynamism -- to the campaign and could help McCain win several battleground states. In the meantime, let me salute to Adam Brickley, who has helped make Sarah Palin a household name -- and a legitimate contender for the V-P role. He accomplished the impossible, and he did it with intensity and style. NOTE: Please be sure to read some very interesting articles mentioning Gov. Palin from the Weekly Standard and the American Spectator. Both are very positive for us. For those that don't know, I am in the process of moving from Colorado to Washington, DC. It has been difficult to keep up the blog in this situation, and I am sure that the actual move this week will make it downright impossible. During this time, I will remain active in the comments section and perhaps post occasional blogs, but I am handing primary control over to two trusted friends while I settle in. From Monday until Wednesday, your host will be Steve Maloney, a prolific blogger who has been with our movement since the very start. As one of our very first edorsements, his efforts really helped kick-start the movement, and we definitely owe him a debt of gratitude. Steve always provides interesting commentary and almost never pulls his punches, so I am sure that you will find him very entertaining. Thursday through Saturday, the ship will be steered by Kristopher Lorelli of PalinForVP.com. Kristopher has put many, many hours of time and effort into our movement. Without him on the team, I highly doubt that our efforts would have been half as successful. Hence, I am more than happy to allow him to take center stage here for a few days. In fact, Kristopher usually finds breaking news about Gov. Palin quicker than me, so you can count on him for a quick and intelligent reaction to anything that happens. So, I hope that you all enjoy Steve and Kristopher, and I look forward to returning to action on Sunday. Roll Call posted the following report today under the curious title "Palin Says She Isn't Being Vetted for VP"...which I find rather strange considering the submission of papers to the national party. ANCHORAGE, Alaska — Gov. Sarah Palin (R), whose name has been floated as a potential running mate for presumptive Republican presidential nominee Sen. John McCain (Ariz.), said she has submitted some paperwork to national Republicans, but added she thinks it is unlikely she will be tapped to be McCain's vice presidential pick. Also, national talk show host Mark Levin said yesterday that he would be pleased with a Palin nomination. Click here to listen to the show. Palin is mentioned exactly 34 minutes into the program and the discussion continues until 35:45. First off, my apologies for not picking up this story earlier, I have been very getting ready to move and have had very little time for the blog. That said, the "Troopergate" story has reared it's head in the national media again, and lots of new information is being released. So I figure that now is the time to shove another nail into this story's coffin and make a concerted effort to get the facts out. The Associated Press article was relatively even handed, but it was not a full accounting of the facts, and the Alaskan media has been downright horrible. I will be updating this post this story to add detail. But for now, I wanted to give a quick rundown of of the developments that have occurred and the facts that I would like to see reported. Gov. Palin held a press conference Wednesday announcing the results of her administration's internal audit regarding the situation. They did find several unauthorized calls made by Palin's staff regarding Trooper Mike Wooten, but no involvement by Gov. Palin, and all of the information will be willingly turned over to Investigator Steve Branchflower. This is an unprecedented level of openness and transparency for an official involved in such a situation. The key item released was the audio of a recorded phone call by Frank Bailey, a member of the Governor's staff, to the Public Safety Department. The phone call was condemned by the Governor, and I will be detailing later how the audio clearly shows that Bailey was not authorized to make the phone call and not speaking for the administration. That said, Bailey raises some interesting concerns about Walt Monegan in the call, which I will detail later. For now, I'll let you watch the press conference and listen to the phone call, I'm interested in hearing your comments. Personally, I think Palin is doing a bang-up job handling his. 1. Investigator Steve Branchflower has a GLARING conflict of interest. Not only did he work closely with Walt Monegan's Anchorage Police department for years in the District Attorney's office, but his wife was a detective in that department, including after Monegan became chief. She was even quoted singing Monegan's Praises to the Anchorage Daily News when he was hired as chief. ("New Chief" by Lisa Demer, Anchorage Daily News, Jan. 31, 2001). 3. State records show that Monegan lied about the number of times he met with the Governor during his tenure. While Monegan claims that the Governor was inaccessible and only met with him four times, records indicate that he had more than two dozen meetings with Gov. Palin, including. Sorry for not blogging yesterday, I was literally away from my computer all day (my local congressional primary was yesterday). However, I did get copies of our petition shipped Priority Mail to the McCain campaign and Gov. Palin's Juneau office. They should be arriving within two or three days. So, to the more than 2,500 people who signed, I can guarantee you that your signatures and comments will be seen by the people who need to see them. I also found out that mail takes at least three weeks to get to Alaska from the lower 48 if shipped using standard postage. So, if you want to send a letter to Gov. Palin before the VP selections are made, you need to send it Priority. Palin blasted Obama on "windfall profits taxes"
UPDATE: Another great (and detailed) refutation of this story has been posted by Bulletproof Diction. For those of you who read the poorly-researched Seattle Times' story claiming that Gov. Palin is a supporter of "windfall profits taxes" on oil companies, I wanted to offer proof that nothing could be further from the truth. The following is a quote from a recent press release from Gov. Palin's office (in which she thanked Barack Obama for finally admitting that tapping Alaskan resources could be a good thing). The Governor did question the means to pay for Obama’s proposed rebate — a windfall profits tax on oil companies. In Alaska, the state’s resource valuation system, ACES, provides strong incentives for companies to re-invest their profits in new production. “Windfall profits taxes alone prevent additional investment in domestic production. Without new supplies from American reserves, our dependency and addiction to foreign sources of oil will continue,” Governor Palin said. I will be posting more on this tomorrow, but if you want the real facts about Gov. Palin's tax policy, there is a massive amount of information provided on her website. As we slowly but surely build the infrastructure of Task Force Palin, I wanted to point you to our new YouTube channel. Right now, it contains all of the Youtube ads that have been produced, and I'm hoping to add some new content soon. I'll probably be putting out a video of my own this week, as I am in the process of getting copies of our petition printed and sent to the McCain campaign and Gov. Palin's office (I don't have a big enough stapler for the petition, so I have to get that done tomorrow). Please stay tuned to TFP, as the setup is going to be a gradual process rather than a sudden launch. Our movement got a big plug this morning from Richard Land, the president of the Southern Baptist Convention. In talking about VP choices with CBS News, Land said that Gov. Palin would be the most exciting VP choice for the Evangelical community. This brings up a key point that I've been trying to emphasize for a while now. Two of our biggest bases of support are Evangelical pro-lifers and libertarian budget-cutters. These two factions of the GOP tend to have an extreme distaste for one another, yet both consider Gov. Palin a hero. That alone should make her a leading choice. Richard Land: Probably Governor Palin of Alaska, because she's a person of strong faith. She just had her fifth child, a Downs Syndrome child. And there's a wonderful quote that she gave about her baby, and the fact that she would never, ever consider having an abortion just because her child had Downs Syndrome. She's strongly pro-life. She's a virtual lifetime member of the National Rifle Association. She would ring so many bells. And I just think it would help with independents because she's a woman. She's a reform Governor. I think that, from what I hear, that would be the choice that CBSNews.com: Who’s on the list of people mentioned for VP that you think would most excite Southern Baptists and other members of the conservative faith community? Richard Land: Probably Governor Palin of Alaska, because she's a person of strong faith. She just had her fifth child, a Downs Syndrome child. And there's a wonderful quote that she gave about her baby, and the fact that she would never, ever consider having an abortion just because her child had Downs Syndrome. She's strongly pro-life. She's a virtual lifetime member of the National Rifle Association. She would ring so many bells. And I just think it would help with independents because she's a woman. She's a reform Governor. I think that, from what I hear, that would be the choice that would probably ring the most bells, along with Mike Huckabee, of course, who's a Southern Baptist. , along with Mike Huckabee, of course, who's a Southern Baptist. This press release is being sent to numerous media outlets today. Be sure to check the new effort as we get it up and running. (Note: This in no way affects the running of this blog, which will continue to operate normally). Building on the continued success of the grassroots movement to draft Governor Sarah Palin as America’s next Vice President, a number of pro-Palin websites are pooling their resources into a new effort, “Task Force Palin” (TFP), which can be found online at tfp.palinforamerica.com. 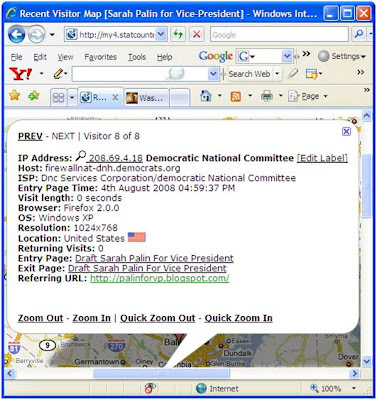 The founding members of TFP are “Draft Sarah Palin for Vice President” (palinforvp.blogspot.com), PalinForVP.com, “Palin for America” (palinforamerica.com), and “Students of America” (myspace.com/studentsofamerica); with more members expected to join after the launch. While TFP will primarily work to convince McCain and his supporters that Sarah Palin would be the best choice for Vice President, it is also intended to look beyond the 2008 election. Regardless of the outcome this year, TFP will continue to coordinate an organized network of Palin supporters around the United States. "It is my strong opinion that Sarah Palin's independence, integrity, and natural leadership style personify America's founding values,” said the proprietor of Palin for America, “Palin's values, now more than ever, must have a strong presence in the office of the executive." Michel Luciano of Students for America also weighed in on why he decided to back TFP, saying, "I believe that Governor Sarah Palin's conservative credentials, fight against corruption, and stance on energy security along with her leadership experience as Mayor of Wasilla and Governor of Alaska make her the best qualified candidate for Vice President of the United States." “Task Force Palin takes the short-term VP effort and institutionalizes it as a more permanent presence,” said Adam Brickley, founder of Draft Sarah Palin for Vice President. “If Palin becomes the vice-presidential candidate, then we will have some of the best coverage of the VP race on the internet. If not, we have an organization which can continue to promote Palin as a national figure and, should the worst occur, a candidate to unseat Barack Obama in 2012. While it’s only in its embryonic stages right now, were hoping to evolve TFP into a centralized headquarters that combines the functions of all of our sites into an online one-stop-shop for all things Palin. TFP will be bigger, better, and more professional than anything we’ve done before”. The following dialogue took place Monday on the Glenn Beck Program. Scott Rasmussen was on to discuss his recent polling, and the talk turned to the veepstakes. Thanks to Hamilton Roberts of Conservative for Change, who made me aware of this. GLENN: Anybody that John McCain could select? RASMUSSEN: You know, I've been going over this and nobody, there's no silver bullets. I think the reason that I've finally come to that conclusion is most Republicans who have been saying this is the person that John McCain has to pick are people who didn't really want John McCain to be the nominee and they are saying we need somebody who can win despite of the fact that John McCain is the nominee. There is -- you know, you can make a case that Sarah Palin, the Alaskan governor who is very strong on the energy issue. GLENN: I love her. Can I tell you something? I think she would be a brilliant pick because she's a total fresh face. She is -- she would be, you know, the first woman vice president. She is plain spoken. She is strong on energy. She speaks the language of the American people. I mean, I just think she would be off the charts. RASMUSSEN: That's right. And she's a former beauty queen and captain of her state champion basketball team. What more do you want? GLENN: Not that that doesn't hurt. I'm not saying that she's a hottie but I'm not not saying that, either. RASMUSSEN: Well, the fact is, Glenn, she is a choice that could be very good. We don't know how she would perform in that national spotlight but, yeah, she is -- especially if Barack Obama does not pick a woman as his vice presidential nominee, that would be a very good pick. Anderson Cooper axes Troopergate story! I had a feeling this was coming, but I wanted to watch most of tonight's AC360 before reporting it. After a few emails from our supporters detailing the facts of the case, the Troopergate story suddenly disappeared from the AC360 website this afternoon. Then tonight, the story did not air at all (The new lead story was "Why isn't Barack Obama farther ahead in the polls?"). Maybe they'll try to go back and rework the story using better facts, but I'm guessing that there won't be any new attempt now that they know just how bad this story would have made them look. "Troopergate" is one of the most poorly executed hit jobs I've seen in my life, and this proves that it has no legs. UPDATE: The Troopergate story has been yanked from the "Anderson Cooper 360" website. With the "Tonight's Show" box now showing a generic tagline for AC360. Thanks to those of you who emailed CNN with the facts. However, this does not necessarily mean that the story won't be running tonight in some form. I'll still be watching AC360 very closely. Well, let's hope Anderson Cooper has more journalitic integrity than the Alaskan papers, because "Troopergate" is his lead story tonight (10 PM Eastern). By the way the story is phrased on his website (reposted below), it could be either a total hit job or a very positive piece. So, will we be getting fact or fiction? Unfortunately, CNN didn't even bother to double check their facts in announcing the program on their website (Gov. Palin is not running against Ted Stevens), so I'm a little worried. The good thing about this is that its something of a win-win situation. With everything we now know about the people shopping the allegations, it is almost impossible to put lipstick on the Troopergate pig, so we have a big opening no matter what angle he takes. If Cooper does his homework and reports on the absurdity of the story, this thing is over once and for all. If he decides to swallow accusations hook, line, and sinker, it could give us a national platform to start putting the smackdown on this thing and end it ourselves. So, Anderson, be VERY careful what you say, because we have all of the facts, documentation, and national support necessary to expose this story for what is is (total baloney) no matter what is said tonight. Personally, I'm actually getting very pumped up about this. As I see it, this is either the outright end of Troopergate (if Cooper reports the facts) or the beginning of the end (if he forces us to do it for him). So, to quote one off my favorite songs, "When darkness turns to light, it ends tonight." If you watch the music video, you'll get a good idea what kind of response I have in mind. Is it payback time in Alaska? GOP Gov. Sarah Palin, who’s running against now indicted powerhouse Sen. Ted Stevens, is now being formally investigated by the Senate herself! We investigate the charges against another Alaska official. Tonight, 10 ET. Looks like somebody is doing a little opposition research. I love StatCounter. Oh yeah...they're scared all right. This is a great idea cooked up by Facebook supporter Steven Abott, and I think we can get a really spectacular turnout if we work at it. Right now, this event is Facebook-based, but I'm re-posting the description here so that anyone can participate. That said, if you have Facebook, please log on and participate there. 4) Write letters to the editor of your local papers and national papers urging Sen. McCain’s support for Sarah Palin.This decision is one of the most important John McCain will ever make on behalf of his campaign and on behalf of the Republican Party. If he gets this wrong, the results could be catastrophic. "Most of the campaign staff strongly prefers a selection from the first two categories — do no harm or reinforce experience. McCain himself, on the other hand, is intrigued by the bolder possibilities of youth or bipartisanship. And he could be especially intrigued by Sarah Palin and Meg Whitman." So, if Kristol (who has lots of connections in the McCain camp) is right, we just need to pray that Sen. McCain goes with his gut. And having watched him through the years, he goes with his gut a LOT. Personally, I think that John McCain is acutely aware of the fact that he did not get where he is by playing it safe, and that the best way for him to win this race is to be the sort of shoot-from-the-hip maverick that America first fell in love with in the 2000 campaign. Listen to your gut, Senator, it has very rarely steered you wrong. "Exactly the veep McCain needs"
In case you missed it, there a was a fantastic column in yesterday's Anchorage Daily News promoting Gov. Palin as "exactly the veep McCain needs". It was written by Texas State University Professor William Ruger and received a front-page link from RealClearPolitics. I hate to interrupt the glee over the approval of Gov. Palin's pipeline proposal, but there is some other news out of Alaska that I feel obligated to address. Today, former Anchorage prosecutor Steve Branchflower was appointed to conduct an investigation into Gov. Palin's dismissal of Public Safety Commissioner Walt Monegan. While I join Gov. Palin in welcoming this investigation, I also share her concern that it may not be unbiased. In fact, I see numerous reasons to question why Mr. Branchflower was even considered for this post, let alone hired. Don't get me wrong, he seems like a stand-up guy from what I'm reading, but his resume (posted by the Anchorage Daily News) casts serious doubt on whether the legislators who hired him really wanted a fair investigation. Branchflower, who served as an Assistant District Attorney in Anchorage from 1974-1998, held numerous positions which required him to work extremely closely with the Anchorage Police Department, where Walt Monegan would become chief in 2001. He provided legal advice to APD officers, trained APD officers, and was even a co-founder of the APD's Homicide Response Team. His wife also worked as a detective for the APD, not retiring until 2002, meaning that she worked under Walt Monegan. In short, it seems impossible to believe that Branchflower, whose entire career was wrapped up in his relationships with the APD, and his detective wife did not have at least some professional relationship with Walt Monegan, who was obviously one of the city's top cops. Mrs. Branchflower also briefly came out of retirement to work as a cold case detective for the Alaska State Troopers. Now, I want to make it very clear that I have absolutely no desire to besmirch the good names of Mr. or Mrs. Branchflower. Both seem to have been exemplary public servants. However, the appointment of an investigator with such close ties to the Anchorage PD is puzzling considering that the case revolves around the firing of the state's leading cop (and a former APD chief) . Branchflower's appointment does nothing to assuage the fears of those who were worried that the legislature would attempt to use this issue to launch a biased and unjustified witch hunt. If Investigator Branchflower wants the public to take him seriously, he needs to start by answering one big question: What (if any) relationship did he have with Walt Monegan in Anchorage and how does he intend to remain unbiased in investigating his wife's former boss? That said, my bigger question is not for Branchflower but for the legislators who dragged him into this mess: are there not qualified lawyers in Alaska who can't be easily linked to a party in the investigation? What was your vetting process, and was it designed to find a truly unbiased investigator or just someone who you thought was likely to go along with an unfounded effort to lynch the governor? If it was the latter, I certainly hope that Mr. Branchflower proves you wrong. And now for the biggest question: does the Alaskan media have the guts to ask tough questions of anyone other than Sarah Palin? BREAKING: Senate authorizes Palin's pipeline! In a MAJOR victory for Gov. Palin, the Alaska Senate has authorized the TransCanada Corporation to construct a natural gas pipeline! The plan has already passed the State House, so all that is needed is Palin's signature. She will be holding a press conference on the subject shortly. With this pipeline, Alaska's natural gas can finally start flowing into hungry energy markets across America. Meanwhile, I'm getting emails telling me that certain TV media personalities are in full attack mode against Gov. Palin, joining the DailyKos/Huffington Post bandwagon. The new pipeline could make Palin a national hero, and the liberal media is doing everything possible to keep her off the ticket. Ladies and gentlemen, we have succeeded. The left-winger are running scared from Sarah Palin...and that is the single best argument for her nomination. YET ANOTHER UPDATE: RealClearPolitics on Sarah: "What's not to Like?" UPDATE: Looks like the buzz is starting to scare the ultra-leftist Huffington Post, they've released yet another desperate hit piece trying to get Palin off the list. The problem is that the buzz, in and of itself, proves that Wooten mud doesn't stick. Question for HuffPo: do you really want to associate yourself with a guy proven to have made death threats against Palin's father? UPDATE: Larry Kudlow reiterates his endorsement of Palin at National Review Online. The media is all over a potential Palin nomination today, and they're even linking us! It started last night with a glowing piece in the Washington Times (front-page in this morning's print edition from what I hear). The article contained gratuitous praise from taxpayer hero Grover Nordquist, leading evangelical activist David Barton, former House Speaker Newt Gingrich, and Concerned Women of America president Wendy Wright. The article was linked on the Drudge Report last night; and between that and the Kudlow endorsement, we received over4,000 hits yesterday. This morning we also received links from both Matt Lewis of Townhall.com and MSNBC's "FirstRead" political blog (MSNBC linked both this blog and the Washington Times article). Of course, to be fair, an LA Times blogger has a hit piece on Palin today, andDailyKos has been on the warpath against her for days. But if you think about it, there's really only one reason that the country's most influential liberals would deign to even think about Alaskan politics...they're scared to death that Palin will be the VP nominee. So, I'm actually loving the unfounded attacks. Keep up the good work, Kos!